From the streets to the beach and everything in-between! Whether it's a road trip, a festival or just kickin? it with your crew ? 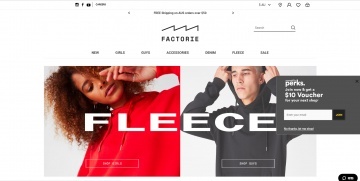 you're sure to find the freshest threads at Factorie. Shop the latest trends for guys and girls. Click a Coupon or click Start Shopping to earn 5% Cash Back at Factorie.